YOU COULD WIN A $50 WALMART GIFT CARD AND A BOOK PACKAGE OF TWO OF ANNE CARYL'S NOVELS. E-MAIL ME YOUR FAVORITE FUNNY "KID" MOMENT ! send to: harvey@pctelcom.coop and put "Beyonder Contest" in the subject line. JUDGING WILL BE DONE BY A PANEL OF TEACHERS, CASEWORKERS AND BEYONDERS. THE TOP PICKS WILL APPEAR ON THIS PAGE. THIRD through FIFTH PLACE WILL RECEIVE CHOICE OF THE BOOKS. "PENANCE" is a contemporary inspirational suspense. Maxine Heller is middle aged, a bit frumpy and ga-ga over Elvis Presley. She is also head-over-heels for her employer, 70 year old Dr. Abraham Sorkin. She's up for a relationship, but is she up for kidnapping and murder? 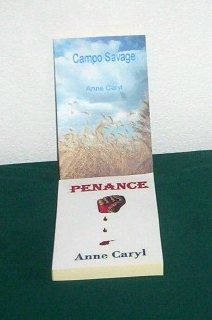 "CAMPO SAVAGE" is an inspirational historical romance. When Emilley catches her husband philandering, her father sends her West. After all, it would be hard enough to mend a broken heart without the scandal of a divorce. But on the train, Emilley sees a murder...or does she? It's hard to tell when you're sure you've inherited your mother's looks, her temperment and her madness.